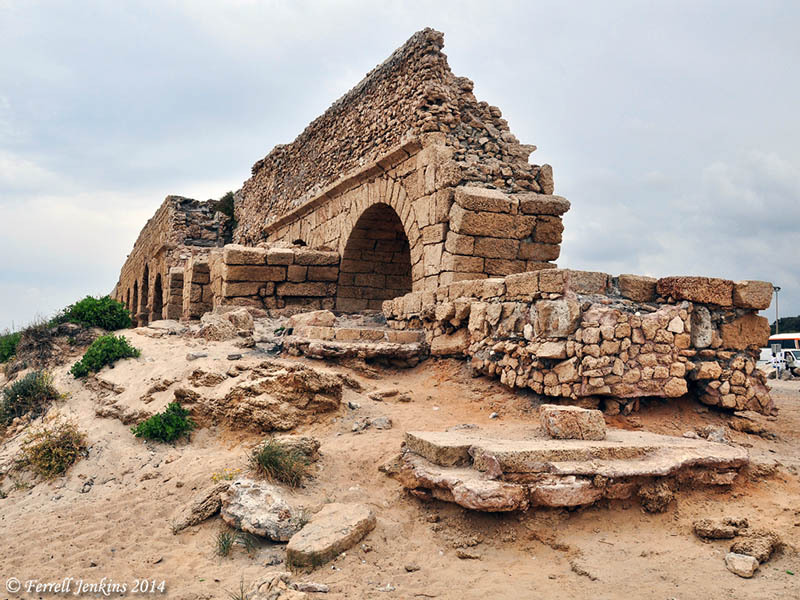 At Caesarea Maritima, visitors may see the high-level aqueduct at the point where it comes to an end likely due to erosion from the waves of the sea. According to Murphy-O’Connor the eastern channel (on the right) was “built by a Roman Procurator about the middle of the C1 AD.” The western channel was built by Hadrian. Some attribute the eastern channel to Herod the Great. The high level aqueduct at Caesarea Maritima. Photo by Ferrell Jenkins. 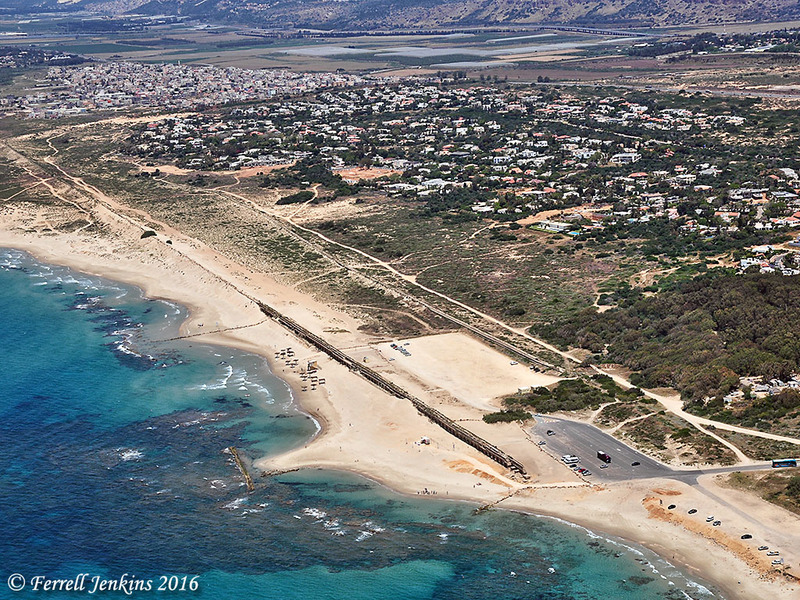 The next image is an aerial photo showing a long stretch of the high level aqueduct at Caesarea. You can also see the low level aqueduct a few yards inland (east). The low level aqueduct was built in the late 4th or early 5th century A.D.
Aerial view of the aqueduct north of the city. Photo by Ferrell Jenkins. Caesarea Maritima was a first century Roman capital and seaport. The gospel was first preached to the Gentiles here when Peter came from Joppa to Caesarea to tell Cornelius words by which he could be saved (Acts 10, 11). The Apostle Paul used the harbor at Caesarea several times. He was imprisoned in the city for two years before departing for Rome (Acts 24:27; 27:1). This entry was posted in Archaeology, Bible Places, Bible Study, Book of Acts, Israel, New Testament, Photography, Travel. Bookmark the permalink. How familiar are you with biblical sites in Jordan? Was wondering whether you saw Todd Bolen’s blog post here: http://blog.bibleplaces.com/2016/02/recommended-study-tour-in-jordan.html?utm_source=feedburner&utm_medium=feed&utm_campaign=Feed%3A+BiblePlacesBlog+%28BiblePlaces+Blog%29 Study tour is with Dr Ginger Caessens at University of the Holy Land. Course is in jeopardy because they have not gotten enough people to sign up. I told her I’d try to drum up some more support. If you know of anybody who would be interested in an amazing tour of biblical sites in Jordan (see the itinerary on link that Todd provides) this June, then let me or Dr Caessens know. Thanks. Darlene and I will always treasure the myriad of memories of our 2006 visit to Israel and Jordan with your tour group! Beautiful aerial shot! I’ve always enjoyed visiting Caesaria, mostly to watch performances at the amphitheater.. an exquisite experience, being so immersed in ancient architecture.